As a 5’2” girl, I have generally kept my rap music enthusiasm to the safe confines of my home. 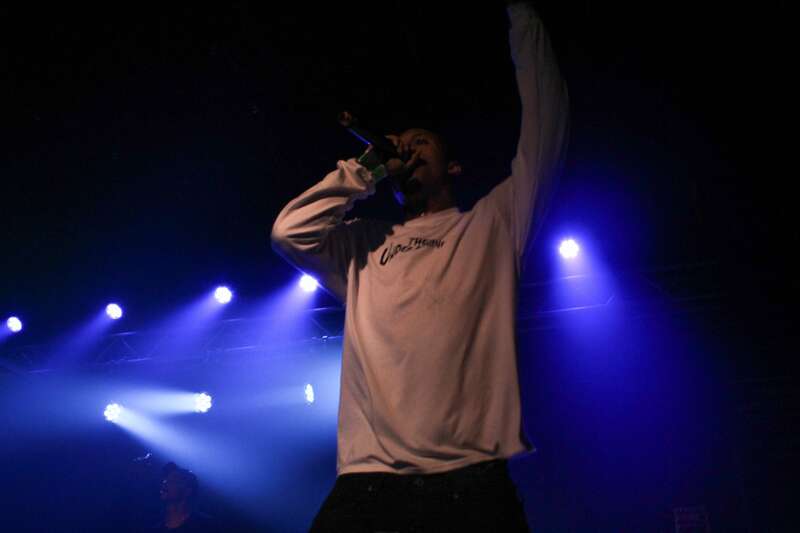 That all changed on a Tuesday night in Brighton Music Hall, and my evening with The Underachievers did not disappoint my expectations of what really goes down at a rap show. Given the aggressive and hard nature of The Underachievers’s music, I was rightfully nervous for what was ahead of me as I approached the venue for the Renaissance Tour. I spent most of the show in the photo pit, observing the audience from behind the barrier like an ethnographer conducting research and feeling out a bit out of place. The anticipation for the duo was just as thick in the air as the smoke and smell of marijuana. Halfway through the first supporting act, Warm Brew, a large figure with an even heftier afro stepped in front of me. Just as I thought to myself “wait… is that—” he stepped on stage to join the show. It was Boston’s own, Michael Christmas, who was welcomed as a pleasant surprise for fans in the crowd. Most bopped along with enthusiasm for the second opener, the hip-hop trio Injury Reserve, but some were just impatient and eager for the arrival of The Underachievers. I couldn’t quite make out what the guy in the front row was shouting, but from his face and the way he was flipping the performers off, it was not nice and Ritchie with a T was not happy. Before I could understand what was happening, Ritchie got a running start and catapulted himself onto him, feet first. The security was quick to control the situation, and the lights came on to exhibit my shocked expression, laughing at the absurdity. The night continued on like nothing happened. The moment AKTHESAVIOR and Issa Gold hit the stage, the crowd was full of energy, with moshing bodies swaying like a tide. Despite having released seven albums since their debut in 2013, the loyal fans were familiar with their entire discography, singing along to every word. Issa and AK hail from Flatbush, Brooklyn, a breeding ground for recent emerging rap artists, and it is reflected in their psychedelic hip hop sound. Their vocals complement each other, giving a push and pull between deep and gritty drawls and spitting quick, punching lines. In the hook of “Crescendo,” a popular banger, Issa describes his sound: “I’m what happens if 2Pac and Jay Elec ever collided.” They have been equated with the group Flatbush Zombies, with whom they have collaborated in a supergroup, Beast Coast, as well as been long-term hometown friends and smoking buddies. The Underachievers often reference both their town as well as their friends in their music, with lines like “I came up from Flatbush, made it on my own/ Now we established, smoke one to the dome” in “Take Your Place” and “Elevated mafia, Flatbush Zombie familia/ No dumb n***as on our roster bruh/ Finna wreck your team if you not with us/ Beast Coast ain’t no stopping us” in “Gold Soul Theory”. The crowd would chant “Beast Coast! Beast Coast!” over and over without either of them inciting it. Issa lit a joint while on stage, receiving much approval from the crowd. He has explained their group name: “I feel like the things that we do could be considered underachieving, like we smoke pot. People would probably meet us at first and be like, They’re probably just potheads. And then they’ll talk to me, or talk to AK, and be like, ‘alright, they’re intelligent.’ So it’s just a flip on that. Like, The Underachievers, even though technically we’re doing underachiever things, we’re bringing positive energy.” Issa and AK have a stoner reputation, yet bring intellectual and enlightened complexity in their lyricism making statements about life on the streets of Flatbush, experiences with psychedelics, and theories of a higher power. At the end of the show, Issa and AK hopped off the stage into the crowd to take pictures with their loyal fans. My concert buddy emerged from the venue looking like he just took a shower, drenched in sweat. He is a frequent rap show goer, but we both agreed that The Underachievers was the rowdiest concert either of us have ever been to. Although it was inevitably a memorable night for me, The Underachievers delivered an outstanding show for all rap enthusiasts alike.